Exceptional quality in this 40 cm doll. He has such a handsome face. Children will fall in love with him and play for hours. Made to withstand a lot of loving! Exceptional quality in this 40 cm doll. She has such a pretty face. Children will fall in love with her and play for hours. Made to withstand a lot of loving! The doll has a height of 20cms when sitting. Total length is approx. 31cms. With the beautiful big eyes and the mothers braided hair, the ladies at the YWCA Bangladesh have created a charming doll. . The mother holds a baby on her back in the kanga sling. This doll is very soft and completely safe for children to play with. The eyes have been appliquéd on the face and the eyebrows and mouth have been hand stitched. As each doll is handmade, each doll is unique. Story of producer group accompanies each doll. Doll is approx. 44 cms tall. A multicultural pair of standing dolls wearing traditional Arabian clothing. These dolls will help teach children about Arabian people and their culture . A fun way to incorporate an understanding of Arabian lifestyle into play. 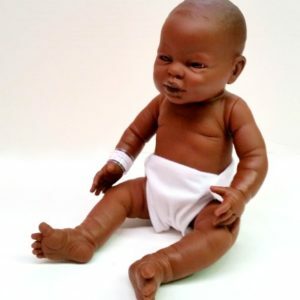 This lovable doll is a must for all child care centres, he comes fully dressed and is anatomically correct.